There's plenty of reasons why the seed and chemicals giant can break out of its funk. It's been gloomy skies for Monsanto this year due to lower corn sales, but there should be a bumper crop of profits later in 2015. Photo: James Jordan, Flickr. Like a bad penny that keeps turning up, seed giant Monsanto (NYSE:MON) is back at it with its efforts to merge with rival Syngenta (NYSE:SYT). The Swiss biotech has twice rejected Monsanto's overtures, saying the $45 billion bid undervalues its business while being overly optimistic about the chances of the merger passing regulatory scrutiny. Monsanto must think the third time's the charm, because it is taking its offer directly to Syngenta's shareholders this week, hoping to build support for dragging its rival's management team to the negotiating table. With shares of Monsanto essentially unchanged since news of the takeover attempt went public in April (even as Syngenta's shares have soared), it's right for investors to wonder whether the agriculture biotech's stock is still a buy. Here are three good reasons why it just might be. 1. The merger agreement goes through. Considering the best Monsanto has done to sweeten the pot for its takeover bid is to offer a $2 billion breakup fee, there doesn't appear to be any risk it will give away the store to acquire its rival. Still, Syngenta says it needs a better up-front offer than the approximately $45 billion on the table, and now it wants a bigger breakup fee, too. The deal would indeed need to clear some antitrust hurdles, but Monsanto has already said it would divest Syngenta's seed business in full to make the deal more palatable to regulators. Together, the two would otherwise own 40% of the global seed market, and Monsanto remains the favorite whipping boy for critics concerned about the concentration of the world's food supply into the hands of agri-corporations. A sale, though, becomes tricky because handing off the seed business to just one of the other major seed producers, such as Bayer, Dow Chemical, or DuPont, would create new antitrust worries. That means several companies would likely become party to a divestiture, increasing the complexity, difficulty of getting approval, and the time needed for it to happen. Yet if the deal does go through, Monsanto would realize obvious synergies from joining Syngenta's crop protection chemicals business with its own. Market-leading herbicide Roundup is represented across virtually all of Monsanto's revenue streams, but overapplication has reduced its effectiveness, and competition from other corners, such as Dow's 2,4-D herbicide could soon impact business. Adding Syngenta's crop protection portfolio would bolster its own herbicide base and give it an avenue for growth. By acquiring the competition, Monsanto can weed out rivals to its leading herbicide Roundup. Photo: Mike Mozart, Flickr. 2. Third-quarter results get an earful. Of corn, that is. The crop represents 40% of Monsanto's total annual revenues but almost 60% of the seeds and genomics segment sales. The biotech suffered a $500 million drop in second quarter corn revenue in the quarter on the back of reduced plantings due to a supply glut, currency fluctuations, and timing issues. However, that latter factor should produce a bumper crop of sales and profits next quarter. Farmers typically buy their seed in the third quarter. Previously, because Monsanto used to sell seed through third-party distributors, it realized the sales in the second quarter because the distributors needed to have the seed on hand for purchase by farmers. But now Monsanto is directly selling its Channel brand seed to the farmers, which means the drop in sales in the first half of the year is really just moving to the second half, primarily showing up in the third quarter. Investors who feared Monsanto was losing its edge even as worldwide demand for corn grows should be encouraged by the sales and profits that will bloom later in the year. 3. Benefits from Climate's change. No, we're not talking about man-made global warming, but rather the data analytics firm Monsanto bought last year that so far looks like an albatross around the biotech's neck. Monsanto had high hopes for its $1 billion acquisition of Climate Corp., which analyzes daily hyper-local weather measurements taken from the National Weather Service and generates 10 trillion "weather simulation data points" that are then used to price its crop insurance and inform its risk analysis services. As valuable as that sounds, Monsanto has found it a hard sell and has slashed pricing by 80% to encourage farmers in to try the service. They've been slow on the uptake so far, but by Monsanto linking free trials of the service to the sale of its seed, farmers will have an incentive to at least give it once-over. That gives Monsanto a twofer: boosting the visibility of Climate's services while pushing sales of its seed higher. And the more farmers who try Climate, the more who might be persuaded to upgrade to the Pro version of the service that provides greatly enhanced detail. 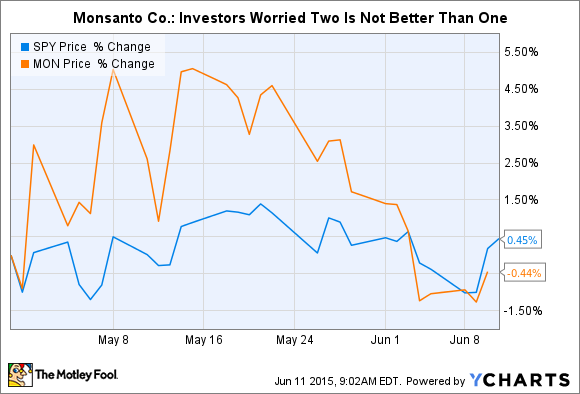 Monsanto's stock is essentially trading sideways until there is more clarity on its effort to acquire Syngenta. Investors should probably discount the effects of that for the moment, because even if Syngenta agrees to Monsanto's terms today the combination won't happen until sometime next year at the earliest. Instead, working to grow its existing lines of business might be the catalyst Monsanto needs to drive its stock higher.